I'm a threading kinda girl because although it hurts (and it really does hurt) you just get so much more shape. You can really hone in on those teeny tiny hairs and create a really strong line. 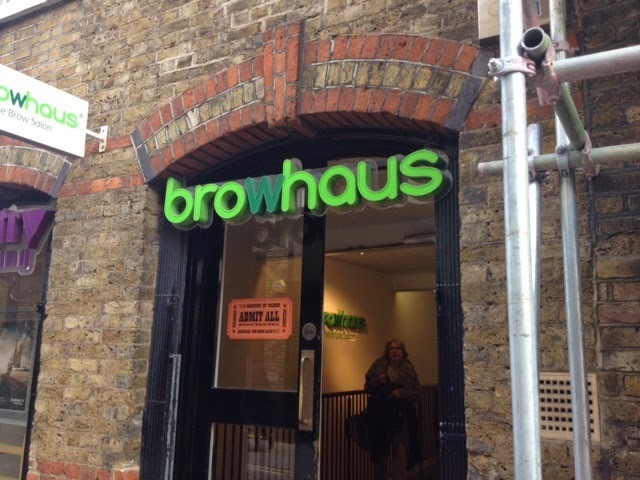 I usually go to Blink Brow Bar but there is a Browhaus just by my office so I thought I'd give it a go. Regret is all I have. Don't get me wrong, she did a good job on my brows but the service was awful. (uh huh, bold AND underlined) Firstly I stood in reception while two beauticians stood there having a chat for about 10 mins before one of them even asked me what I was doing. Er...what do you think I'm doing here? I filled out a form and waited to be called. My beautician didn't speak much, she told me what she was going to do then without warning started attacking me with the thread. It hurt but this didn't seem to bother her at all. A little bit of friendliness wouldn't have gone amiss lady! We got through it with her trying to sell me a package deal during the last 5 minutes. And boy, did she try. I said no, told her I didn't want one and then I even tried to tell her I couldn't afford it but she just would not listen. She took me back to reception and tried again while the receptionist watched. Talk about feeling under pressure. I still said no. Then she walked off and the receptionist tried! It was so uncomfortable. I was very firm at which point she just became plain rude. I paid and waited for my receipt which didn't come. She looked at me and said "see yah". I felt such outrage, I just walked out. Despite the good brows, I will not be returning. Ever. I'm sorry Blink, please take me back. I love a brow post. My woman in Crawley was so good this weekend and only £4! Stick with what you know gurlll don't let noone touch your brows - luckily she didn't ruin them! !